Outsider Art Fair, 2018 atmosphere. 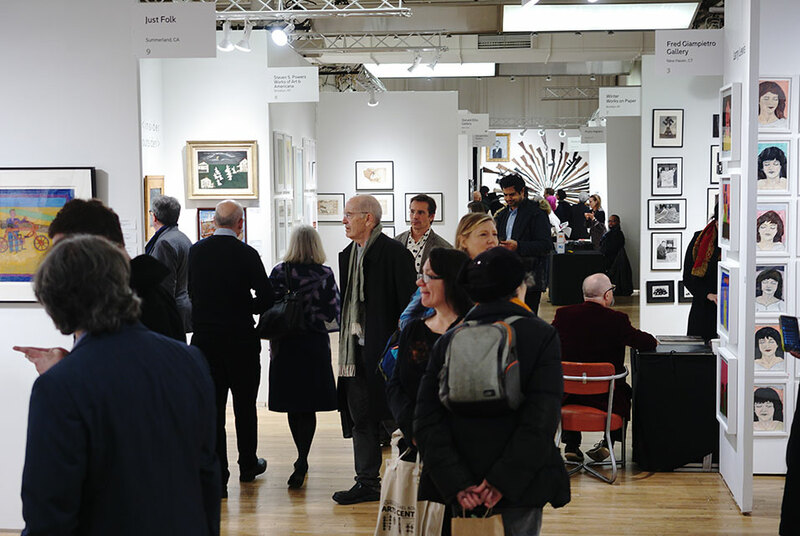 NEW YORK, NY.- The Outsider Art Fair, the only fair dedicated to Self-Taught Art, Art Brut and Outsider Art, is pleased to announce the exhibitor list for its 27th New York edition, taking place January 17-20, 2019 at The Metropolitan Pavilion. The fair will showcase 67 exhibitors, representing 37 cities from 7 countries, with 8 first-time galleries. This year, OAF will host two of its hallmark Curated Spaces. Good Kids: Underground Comics from China will feature zines and original drawings created by Chinese artists. Co-organized by Brett Littman (Director, Noguchi Museum, New York) and Yi Zhou (partner and curator of C5Art Gallery, Beijing), these works deal with subject matter that is scatological, sexual, puerile and anti-conformist, making the distribution and sales of these work in mainland China complicated to almost impossible.  Curated by Raw Vision Magazine senior editor and art critic Edward M. Gómez, the presentation will feature works by various artists with whom Kind was associated, including Adolf Wölfli, Martín Ramírez and Domenico Zindato. OAF visitors can count on seeing artworks by the most acclaimed masters in the field, like James Castle and Eugene Von Bruenchenhein at Fleisher/Ollman (Philadelphia); William Edmondson at Ricco/Maresca (New York); and Anna Zemánková at Cavin-Morris (New York). More classic art brut can be found at Pol Lemétais (Saint Souver de Moustier, France) including works by Madge Gill and Carlo Zinelli. African-American artists from the South will be represented in several booths including a solo presentation of Bill Traylor drawings at Just Folk (Summerland, CA); Ike Morgan and Hawkins Bolden at SARDAC (London); Mose Tolliver and Purvis Young at Main Street Gallery (Clayton, GA); Lonnie Holley at American Primitive (New York); and Mary Whitfield at both Phyllis Stigliano Art Projects (Brooklyn) and Galerie Bonheur (Palm City, FL). Among first-time exhibitors, Julie Saul (New York), will present vernacular photographs by legendary artists Morton Bartlett and Miroslav Tichý, and will also introduce works by Siberian self-taught photographer Nikolay Bakharev. Maccarone (Los Angeles + New York) will present a solo exhibition of political drawings by Jim Carrey, including new material created after the mid-term elections. Newcomer SAGE Studio (Austin, TX) will offer the drawings and paper sculptures of David Sulak while returning exhibitor Jennifer Lauren (Manchester, UK) will present early Nek Chand works from the 1970s together with the ceramic sculptures of Shinichi Sawada. New discoveries at OAF will include a rare series of mediumistic drawings by Angelika, a German patient who resided at a psychiatric hospital in Potsdam during the Second World War, at Henry Boxer (London); Australian artist Angus Warrens dreamscapes at Wilsonville; and the ethereal colored pencil drawings of golf courses by Valentino Dixon at Andrew Edlin. The 48-year old Dixon recently gained his freedom when, after spending 27 years in prison, his erroneous murder conviction was vacated. Almost Art Project (Beijing) comes off its successful 2018 debut, introducing the works of Chinese outsider artists Feng Cangyu, Li Qing and Luo Xiufang and James Barron Art (Kent, CT) will debut the strangely beautiful paintings and rock sculptures of Italian artist Elisabetta Zangrandi. 2019 Exhibitors: Austria, Maria Gugging: galerie gugging; China, Beijing: Almost Art Project; France, Paris: Galerie Hervé Perdriolle; Saint Sever du Moustier: Galerie Pol Lemétais; Japan, Tokyo: Atsuko Barouh, Yukiko Koide Presents; South Korea, Seogwipo, Jeju Island: Korea Art Brut; United Kingdom, London: Raw Vision, SARDAC; Manchester: Jennifer Lauren Gallery; Surrey: Henry Boxer Gallery; United States, Claremont, CA: First Street Gallery; Los Angeles: Good Luck Gallery, Maccarone; Oakland: Creative Growth Art Center, Tolna Searle Projects and Krowswork; Oxnard, CA: Esperanza Projects; San Francisco: Creativity Explored; Summerland, CA: Just Folk; Kent, CT: James Barron Art; New Haven: Fred Giampietro Gallery; Palm City, FL: Galerie Bonheur; Atlanta: Mason Fine Art; Clayton, GA: Main Street Gallery; Iowa City: The Pardee Collection; Boise, ID: Stewart Gallery; Chicago: Carl Hammer Gallery, Project Onward; Birmingham, MI: Hill Gallery; Brooklyn: LAND Gallery / NAP Projects, Steven S. Powers, Phyllis Stigliano Art Projects, Winter Works on Paper; East Hampton, NY: Norman Brosterman, Wilsonville; Kingston, NY: One Mile Gallery; New York City: Peg Alston Fine Art, American Primitive Gallery, Antillean, Cavin-Morris Gallery, Dutton, Andrew Edlin Gallery, Fountain House Gallery, God's Love We Deliver, Marion Harris, Hirschl & Adler Modern, Humbaba Fine Art, Joshua Lowenfels Works of Art, Mariposa Unusual Arts, Pure Vision Arts, Ricco/Maresca Gallery, Julie Saul Gallery, SHRINE; Columbus, OH: Lindsay Gallery; Philadelphia: Fleisher/Ollman Gallery; Wynnewood, PA: Center for Creative Works; Chattanooga, TN: Tanner-Hill Gallery; Memphis: Tops Gallery; Austin: SAGE Studio; Dallas: Chris Byrne; Rochester, VT: BigTown Gallery; Bainbridge Island, WA: Nisqually Gallery; Milwaukee: Portrait Society Gallery.